Having lived imprisoned her entire life, a young girl is rescued by a dragon and together they fight the imperial empire that held her captive. Having lived imprisoned her entire life, a young girl is rescued by a dragon and together they fight the imperial empire that held her captive. Games these days, although they are terrific and better, are being increasingly complex to some people. 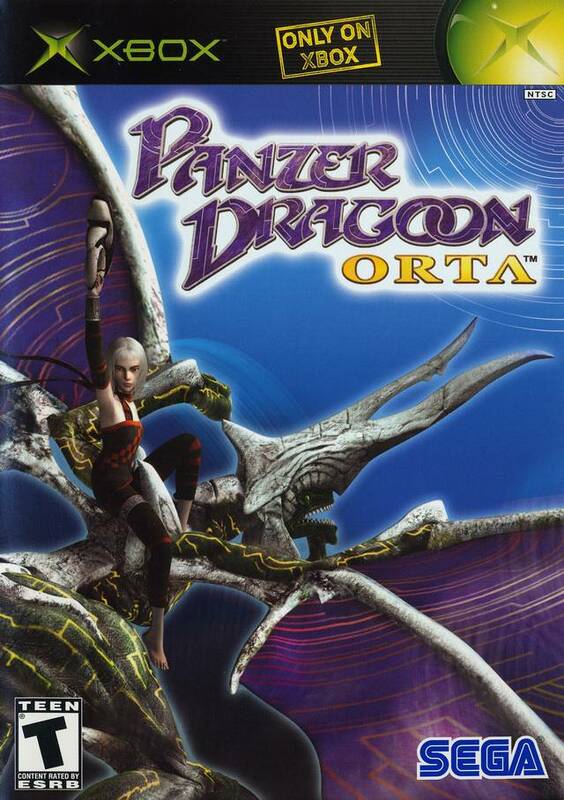 Along comes "Panzer Dragoon Orta", combining a good saga of a story with simple, "Raiden Fighters"-like gameplay. In other words, it plays like an old-school, top-down rail shooter such as "Raiden Fighters" or "1942", except the point of view is behind the dragon instead of above it and you use the trigger buttons to turn around 90 degrees to kill the enemies surrounding you in the left or right or behind you. People may say that I should compare this more to "Star Fox", but, in actuality, you home on to enemies, use berzerker attacks, and get increasingly powerful as you level up. Also, in a stroke of originality, the dragon you control can change form with a touch of the Y button (either regular form, which is a basic dragon that can fire decent beams and have a decent glide gauge, or heavy form, which fires powerful beams but doesn't glide, or glide form, which has a longer glide gauge but does not home on to enemies but guides you to the nearby enemies). The story is that you play a girl who is captured in a prison but freed by a dragon and you befriend it and have it help you defeat the enemies. In other words, this game is very original and simple. 10/10 This game has three main things going for it which make it worthy of a ten by me. First, the gameplay. Rail-shooting does not appeal to everyone, but for those of us who find it almost meditative to sit back and concentrate on our marksman skills, this release is almost pure bliss. There is the added feature of being able to bank at any angle slightly, as well, which is helpful if you just can't destroy that incoming missile soon enough. The ability of the dragon to morph into different battle-types adds many strategic possibilities also, though if your mind is not in the mood to strategize, the default type works pretty well in every level. Second, the imagination. The worlds, characters and creatures are stunningly gorgeous. I recently replayed this game (in January of '08), and even with all the jaw-dropping titles of the current generation systems, the visual and conceptual creativity that went into PDO is absolutely phenomenal to me still. It makes me want to shake the hands of everyone involved in this project. It also makes me sad how little recognition it received. Third, the two title characters. The Dragon, particularly in its default form, is a beautiful creature. There is one cut scene in which it arises slowly from the snow, very majestically, and it never fails to give me chills. And Orta. Orta is, of course, a video game heroine, and therefore by law she is required to be gorgeous. But, perhaps on purpose or by accident, she has more depth to her than any other fantasy-game character I have seen. There are very genuine expressions of sadness and wonder in her face, and someone clearly got her essence dead on in designing her. The bond she has with the dragon is very moving, and by the end, I felt very attached to both characters. I know Panzer Dragoon Orta is a thing of the past now. It's done, and there's not much chance of people suddenly realizing what a great game it was. But I come back to it often, and have yet to not find something to marvel over in it. For the few of us who love this game (I notice, as of the time I write this, that there are 27 users here on IMDb who rated it! ), it at least kind of feels like a very intricate piece of art, composed just for us.